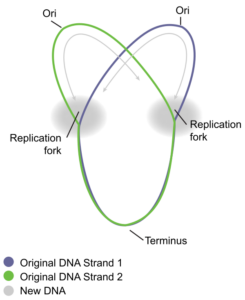 Figure 4: DNA replication in prokaryotes, which have one circular chromosome. DNA replication has been extremely well-studied in prokaryotes, primarily because of the small size of the genome and large number of variants available. Escherichia coli has 4.6 million base pairs in a single circular chromosome, and all of it gets replicated in approximately 42 minutes, starting from a single origin of replication and proceeding around the chromosome in both directions. This means that approximately 1000 nucleotides are added per second. The process is much more rapid than in eukaryotes. Table 2 summarizes the differences between prokaryotic and eukaryotic replications.